Edwin Farrugia was arguably one of the best Maltese full-backs of the 1970s. Born on July 9, 1952 in Floriana he started his career with the Floriana Primary School team and with Floriana's U-15 XI. In those days, he preferred to play in attack but with time, his defensive qualities emerged and he was switched to the half-back line and later on to full-back. Left full-back was definitely his best role although he was quite comfortable on the other flank. 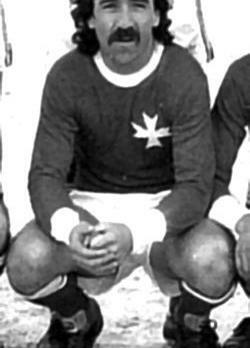 He made his debut for Floriana on October 4, 1969 against Gżira United. That season he played only four league games, three of them as a substitute. It was enough, however, for him to win the first of five championship medals for Floriana. In those days it was very difficult for a young player to break into Floriana's first team. It was even more difficult for him because he had to compete for a starting berth with international full-back Joe Grima. In 1970-71 he only made one first team appearance but the following year he became more involved, mostly as a substitute for Grima. Then, Grima retired, leaving the left-back berth vacant for Farrugia. From then on, he never looked back and quickly established himself as, perhaps, the best full-back in the First Division. His career with Floriana lasted 13 years in which he won 17 major honours. He was also a first choice with the national team with whom he was capped 40 times. His international career started on November 12, 1973 in the famous match against Sweden at the old Empire Stadium. On the other hand, he played his last game for Malta on December 21, 1983 at the Estadio Benito Vellamaun in the infamous European Championship match when Malta lost 12-1 to Spain. In 1982-83, Farrugia was transferred to Ħamrun Spartans. Although by now he was in the twilight of his career, he seemed to find a new breath of life in Ħamrun. He stayed with the Spartans for five eventful seasons in which he added to his medal collection with another five major honours, including two championship and two FA Trophy medals. Farrugia retired at the end of the 1986-87 season. He was probably the last in a long line of traditional full-backs whose role was mostly defensive. Today, the role has been changed dramatically. The wing-back, as he is called, is first and foremost an attacker who is required to track back to close the gaps in the defence when his team is defending. Edwin, however, would probably have adapted quite well to this new role. After all, he started his career as an attacker. Farrugia played many great games in his career but his best moment came in November 15, 1981 when Malta met Poland at the Stade Olimpique, in Wroclaw. Malta conceded a goal after only a few minutes and this upset the Maltese defensive plan. During the first half, Malta's defence held out well but after half-time the Poles stormed our rearguard and scored more goals through Smolarek (2), Dziekanowski and Boniek. In those days it had already become customary for players of opposing teams to swap jerseys at the end of a football match. Many players collected these shirts as souvenirs. On this occasion, however, Farrugia preferred to retain his jersey as it marked his 25th match for the national team. As the teams were making their way to the dressing rooms, hundreds of Polish enthusiasts tried to obtain the autographs of the players as a souvenir of the occasion. Among them was a 15-year-old lad on crutches who could not force his way through the crowd. Farrugia, with great difficulty, approached the boy, took his autograph book and obtained the signatures of all the Maltese players. The crowd was just as big when the players walked to the coach to return to their hotel. Farrugia, who had already boarded the bus, noticed the same disabled boy in a corner away from the crowds, waving to the Maltese group, although he was finding it difficult to retain his balance. Farrugia immediately stepped down from the coach, went across to the boy and presented him with his cherished red Malta jersey with the eight-pointed cross. The crowd present greatly appreciated the gesture and it was favourably commented upon by the Polish newspapers. It was a fitting incident in a year dedicated to the disabled. Back in Malta, Farrugia was awarded the 'The Best Sporting Act' award for 1981.